A report prepared by Bigelow Aerospace for NASA concludes that the commercial approach that the space agency used successfully for developing commercial cargo transportation to the International Space Station should also be applied to developing transportation beyond Earth orbit, including in the vicinity of, and to the surface of, the Moon. The report, prepared under a Space Act Agreement between NASA and Bigelow Aerospace announced earlier this year, is being formally released today at a press conference in Washington. It recommends that NASA pursue a partnership with industry to develop beyond-LEO transportation systems, given NASA’s constrained budgets and the record of success by NASA’s Commercial Orbital Transportation Services (COTS) program to develop launch vehicles and spacecraft to supply the ISS. The report specifically advocates an approach modeled on the COTS program, where NASA used funded Space Act Agreements (SAAs) to support the development of cargo transportation systems by SpaceX and Orbital Sciences. That led to service contracts with those two companies to transport cargo to and from the station. NASA is following a similar approach with its commercial crew program, using funded SAAs to support development of crewed systems, which it plans to follow up with contracts to complete development and certification of those systems and initial purchases of flights. That suite of spacecraft includes Bigelow’s own vehicles. 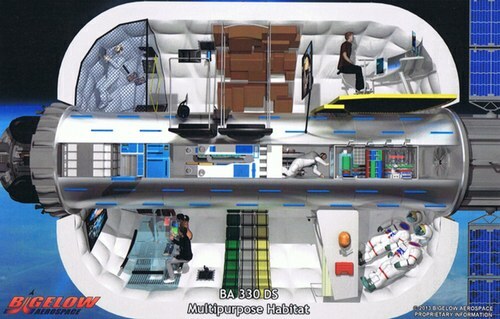 The report states that the company’s first two BA 330 expandable habitats, modules with an internal volume of 330 cubic meters once deployed in orbit, will be ready for launch by the end of 2016. Bigelow Aerospace is also working on a version called the BA 330-DS for missions beyond Earth orbit; this will be very similar to the basic BA 330 but with improved rad-hardened avionics and additional shielding, as well as a larger inventory of spare parts for deep space missions. A modified BA 330-DS would be capable of landing on a planetary body, like the surface of the Moon. The report also outlines additional hardware, including tugs and power modules, that could be used in conjunction with the BA 330-DS modules to support missions beyond LEO. Parts of this plan could form elements of future space policy, particularly the idea of using a combination of government and commercial funding to proceed onwards beyond LEO. Also the COTS approach has proved to be a very successful structure for procurement of services. Bigelow habitats are a natural for future crewed outposts in destinations beyond LEO. Fingers crossed for a positive response from the White House, the Hill and NASA’s planners. I have been proposing something similar, but in GEO, as the next step forward, and referring to it as “Gateway Earth”, housing both astronauts and space tourists almost at the edge of Earth’s gravity well. This concept is really quite close to what the petition at LunarCOTS.com calls for. I’m hoping that NASA will take up Bigelow’s recommendation and that Congress will agree. I think that it is a real possibility because this could remove the thorn-of-an-argument that the Administration should have never removed the Moon from the table. A Lunar COTS approach will not be NASA proper going to the Moon but that such an effort would be “led” by American commercial companies. Importantly, this could be done in such a way that did not threaten the cherished SLS/Orion programs. The current public-private programs are compatible with the SLS/Orion and so could a Lunar COTS program provided that the Lunar COTS program is a budgetary successor to the current public-private programs. As for the lunar property aspect of the proposal…I am less than enthused to see that. I fear that Lunar COTS might not be funded if it is too tightly wed to this controversial issue. Only natural it should also be extended to BEO flights. Good proposal for discussion, the main sticking point which will have a major impact internationally is the land ownership and mineral exploitation element. If not managed wisely we will see a space race for land, which could have dour consequences. Will the Bigelow report be made available to the general public? I don’t see it on their website. It’s a NASA report therefore paid for by the taxpayer and therefore should become publically available. Precluding lunar/mars property issues but reflecting on the hardware and livability issues; is anyone addressing one of the biggest soft/hard sustainability supply problems. By this I mean hydroponics for oxygen. I have not seen any reference from contractors/sub-contractors about these issues which I would think would be essential for long term flights or projects that address a more permanent residence in space, on mars or the moon? @RSouthwick Hydroponics could be used to recycle the air to produce oxygen. Humans use a lot of oxygen so the greenhouse containing the plants will have to be very big, say the size of a farm. Consequently if a biological method is chosen construction will have to wait for many years, until sufficient machinery can be delivered to the Moon and Mars to expand the bases. A method that also produces food as well as oxygen may be possible.